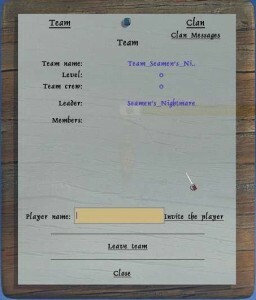 In world of pirates it can be a really good idea to join a team or start one and invite other players to join it. If a player is already in a team or absent, you will get a message telling you so. If you are team leader and you leave team without giving the team lead to someone else, than the new team leader, will be the first player in the members list. If you go afk you can use the command /afk this means you cannot get the team lead, unless only players who used the afk command left in team. If you desire to join a team, you can ask for a team or if you know an already ongoing team, you can use the command /teamjoin team_name Here the name is the name of the team leader. Note that all team invites has to be accepted by the player who got invited and every team join request have to be accepted by the team leader. For each level the team increases, you gain more bonuses. You need to be at least two people in the team, for it to increase level. 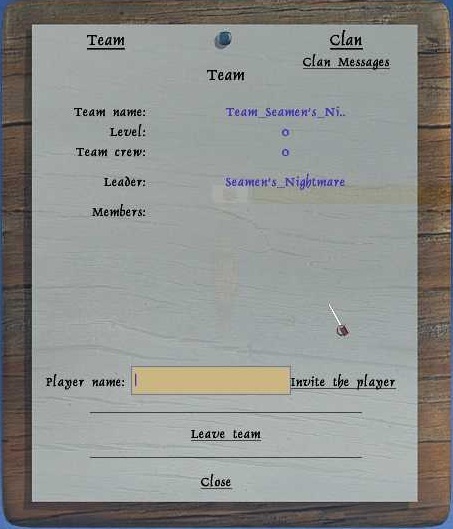 Team level increases as long at least one team member is at sea. Level one to nine, will increase level every ten minute. Level nine to thirteen will increase level every thirty minute. When someone joins the team, it will decrease with one level. If you had level thirteen for longer than thirteen minutes and someone joins the team, it will decrease to level twelve, but shortly after increase to level thirteen again. This means that if a team mate fence a ship, you are able to team board the ship to add more crew to help your team mate. This means when you shoot or sink ships you get 5% more reputation points at own nation, then without team. This means you get more gold when fencing ships or cities, to share with your team mates. This means you get 5% more firepower when shooting ships, so you more easily can sink them. This means when you get shoot by other ships, your flag ship losses 5% less condition. This means you lose 5% less cannons on your fleet when shoot by other ships. This means you lose 5% less crew when shoot by other ships. This means that if your team mate fence a ship and you join the fence to help him, you loss 5% less crew. This means you lose 20% less condition on your flag ship, when shoot by a forted city. This means you do 20% more damage to soldiers in the city, when shooting a city. This means your team mates can team fence a city, to help you with their crew. This means you can make a clan, if all criteria are meet. Learn more about clan here.